If you are renovating your home, you should consider buying mahogany front doors. Mahogany is rich wood that is as durable as it is stunning. Almost any home looks better with a dramatic entryway. Mahogany is also perfect for interior use as well. It is a very versatile wood, with many uses and many fans of its rich aesthetic. Some homeowners may be unsure how to incorporate mahogany into their renovations. They may worry that it will be too dark or dramatic for their home. Also, mahogany door prices can be higher than other types of wood. As a result, people want to be sure they do not make a mistake by buying this type of door. While solid wood doors are popular choices, there are other options available. Take a few moments and learn about different models of mahogany doors. You could still find the perfect mahogany option for you. Once you learn more about the various styles available, visit Southern Front to see their catalogue. You can visit them in store or online at http://www.southernfront.com. 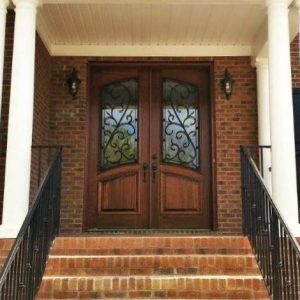 Southern Front is proud to supply high quality pre-made and custom mahogany doors. They ship to customers across the U.S. and Canada. Interested customers can contact Southern Front by calling 291-890-5860 today. It is true that some entryways look dark and dim with a solid wood door. In situations like these, consider mahogany entry doors with sidelights. These doors usually have glass inserts matching the other inserts along the side. The result is a brighter hallway with a very rich aesthetic appeal. When it comes to style, your choices are almost endless. Glass may be transparent, decorative, or frosted letting in as little or as much light as you want. When you shop for doors with sidelights, be sure you look for a supplier you can trust. It is important that they use the highest quality of materials possible. Ask questions about composition and construction when you browse. You should always shop from a retailer you can contact with ease. If anything goes wrong with your door, you want to be sure you can contact someone to fix it. Consumers looking for this style of door can visit Southern Front. Southern Front has a wide selection of doors with sidelights available. You can view their catalogue by visiting http://www.southernfront.com/. You can also contact Southern Front by calling 291-890-5860. They can help you find the perfect door for your home. If a door with sidelights is not right for you, there are still options you can consider. One popular choice for homeowners is to buy custom mahogany doors. This can meet your need for a beautiful door while also ensuring you get one that suits your home. Custom options are also ideal for entryways that are an odd size. You can include almost anything in custom choices. Popular combinations of materials include mahogany, glass and iron inserts. These unique decorative touches can help set your home apart from the rest. If you decide to shop for custom solutions, be very picky when it comes to finding a supplier. Ask about references or a gallery of prior custom work. Avoid hiring any company without professional affiliations or an impressive portfolio. Remember that your front door gives off a powerful first impression. Be sure that it is the one you want your home to project by using a reputable custom retailer. Southern Front is happy to offer their customers custom door solutions. You can visit them online at http://www.southernfront.com to see pre-made doors. If you fail to find something you like, contact them to get more information about custom orders. Prospective customers can contact Southern Front by calling 291-890-5860 today. Do not let the fact that you have mahogany interior doors deter you from shopping for an exterior one. Some people may worry that using mahogany inside and out is overkill. In some cases, it may be true. For example, buying doors that look almost identical will ruin your entryway’s look. Doors in contrasting shades can also be distracting to the eye. The best way to use mahogany like this throughout your home is to keep it on separate levels. Too much of the same dark wood on the same level will look very dramatic. In some cases, this separation might not be possible. In those situations, try to find a door with decorative touches or a glass insert. Keep the door in the same or similar shade. This can lend visual diversity while preventing your home from looking too busy. If you are looking for mahogany doors in any part of your home, visit Southern Front. Southern Front Stained Glass and Door has many mahogany doors for you to view. These doors come in a variety of styles and stain options. It is easy to find the perfect one for your home by shopping at Southern Front first. Visit them online at http://www.southernfront.com/. You can contact them by calling 291-890-5860 and asking for more information. If you are renovating, consider pre-made or custom mahogany doors. These doors can add a level of sophistication to any home. They can even help you fall in love with your entryway. Take your time with this decision and shop from only the best vendors. These precautions will ensure you love your door for years to come. Consumers thinking about mahogany doors can call Southern Front. They have a wide selection of mahogany doors of all types. If you do not find one you love, Southern Front is happy to discuss custom solutions. Visit them online at http://www.southernfront.com to see their selection. You can also contact them by phone at 291-890-5860. If you are looking for mahogany front doors, you cannot go wrong by visiting Southern Front.